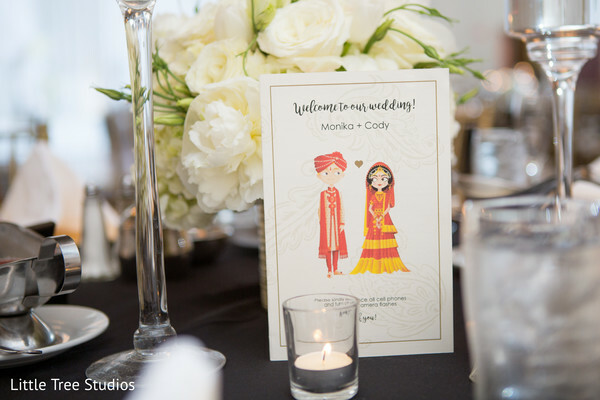 After completing their journey down the mandap, Monika and Cody not only mixed their respective backgrounds but combined the allure of black and the elegance of white in a contemporary western wedding bash at the upscale Sheraton Columbus Capitol Square! 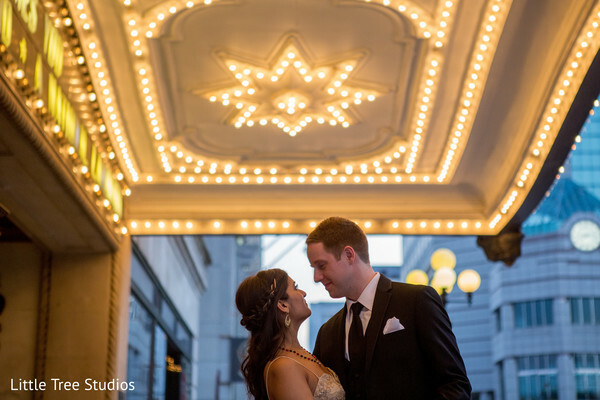 The renowned Little Tree Studios joined the sweet couple to snap all their glam before the dancing hours in a romantic street photo shoot. The lovely Monika posed in an ivory color gown while holding hands with her good-looking husband Cody who made a real statement in a slim black suit and narrow necktie. 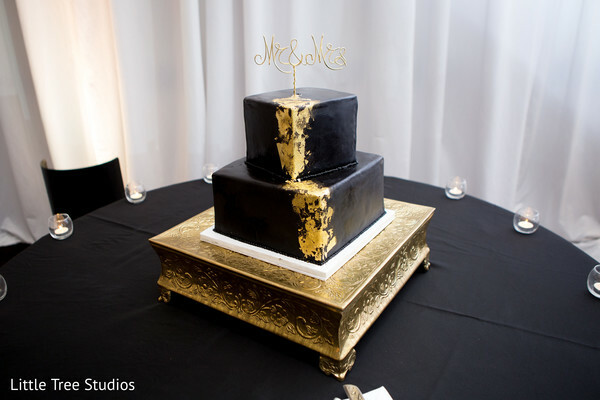 Certainly, the guests won’t forget the refined black and gold wedding cake that Short North Piece of Cake baked for the soiree as well as the fresh white floral arrays over the black linens created by Dalay Ket Event, which gave a sophisticated feeling to the night! To complete this amazing day, Josh Staley Productions provided the top-notch entertainment that got the crowd in the perfect party mood! 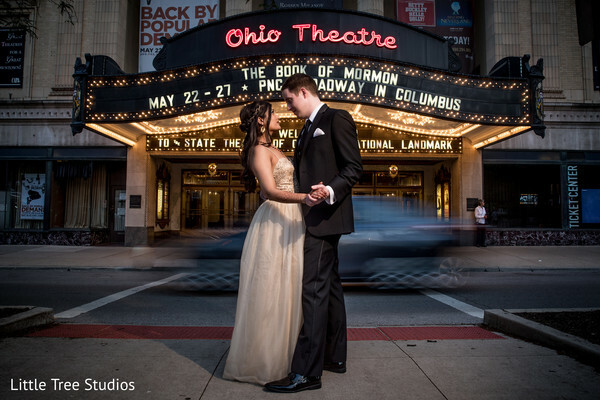 Check out the full gallery for more stunning pictures of the big day! We met first day of freshman year in college. Our dorms were right next door to each other. There wasn't one big moment where I know he was the one, but many small meaningful moments throughout our relationship. We were getting ready to meet some friends for New Year's Eve, and as I was rushing to finish getting ready, Cody mentioned my outfit was missing something. I quickly answered, yes I know I need my shoes! But instead, as I was turned grabbing my shoes and my coat. When I turned around, I saw Cody down on one knee with the ring box opened. I was so shocked I exclaimed "Are you serious?!". After some wonderful and intimate words, he proposed and of course I said yes! 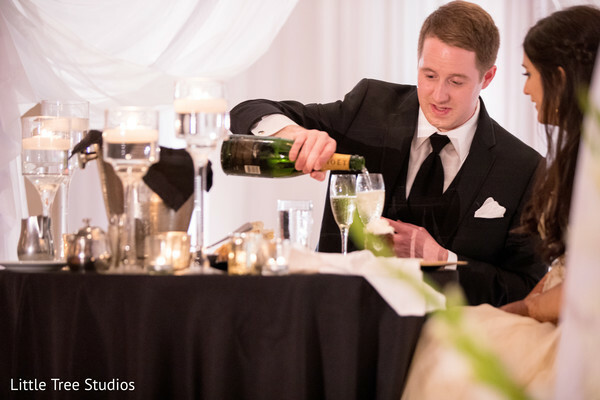 We live in NYC and knew getting married in the city would be too expensive, so we started looking at venues in Columbus and the Boston Area. 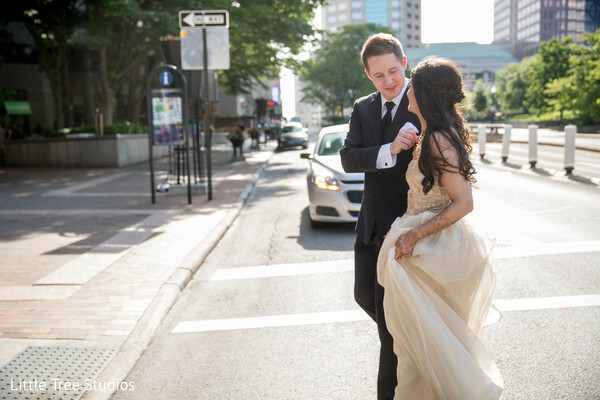 We decided on The Sheraton in Downtown Columbus as it had everything we were looking for- easy and convenient location, beautiful ballroom and guest rooms, and excellent food. The decor and theme were all Cody and I. Cody was the one to pick out the colors, and we have similar tastes in decor to begin with. For our Outfits, we wanted something traditional, but not too obvious and over the top as we didn't want to take away from us. 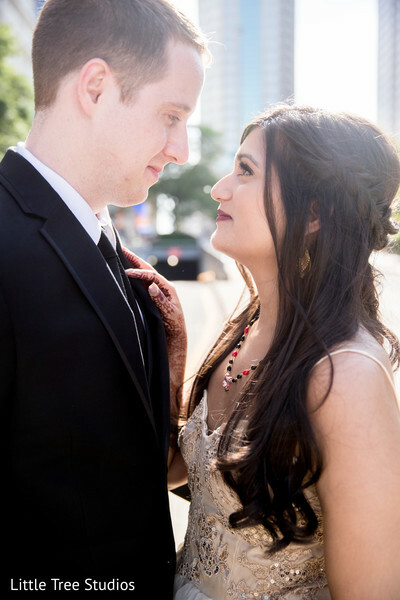 We did two outfits (one Indian for the ceremony, and one American for the reception) as we wanted to have a fusion of both the cultures we grew up in. I knew for makeup I wanted to keep it similar to what I normally have, because I still wanted to look like myself and feel comfortable. As for the hair, I design hair accessories for a living so I knew I HAD to wear something I designed in my hair. I knew I wanted it away from my face, so incorporating my chain braid-in into a half up hairstyle was an easy choice. All vendors were personally recommended as we still have a lot of friends in the area, and I have some old event planing connections. Most details were found/ curated with both of us. We made a point to agree and plan the wedding together so deciding all the details was a team effort. It may sound like it was hard, but it wasn't hard to plan and decide things at all. Since we were doing a fusion wedding, we wore Indian clothes for the ceremony and American clothes for the reception. I always admired the saree my mom wore to her wedding, so I asked if I could wear hers. As a fashion designer, and someone that likes to stand out from the crowd, I knew I wanted to design and make my own wedding dress for the reception. I didn't want to be traditional and wear white, and pink is too obvious as the alternative color, so I decided on champagne and gold. I also went to a bridal store to try on different silhouettes to help decided on the style I liked. I also looked through different ready to wear shows for inspiration. While everyone knows wedding planning has it's ups and downs, Cody and I were pretty much on the same page with everything, which made everything easy and wonderful. We both thoroughly enjoyed the food tasting and the cake tasting. I also personally loved designing all the signage and programs. It was a lot of fun overall, and really hard to pick a specific part as a favorite. Being engaged is such a magical time, which I know sounds cliche, but it really is! And also, so cliche to say, but we definitely grew closer as a couple, and I knew we're on the same team for life. From all the comments afterwards, everyone really had a great time and thought everything was beautiful, but it seems the best part was the food/ open bar and the dancing. 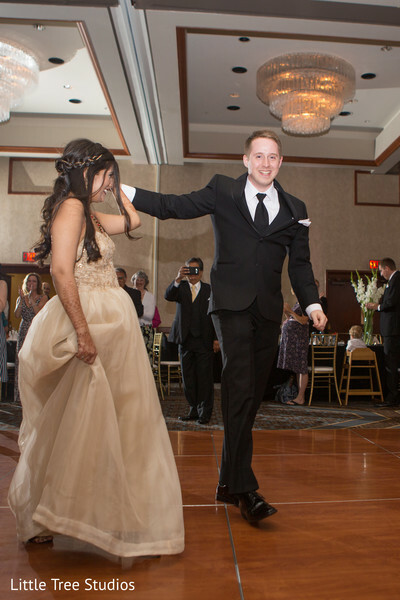 Our friends and family will dance to just about anything, but the atmosphere and the music was so much fun that everyone had such an amazing time. I actually asked Cody about this after we got back from our honeymoon, and he said his favorite part was the ceremony. 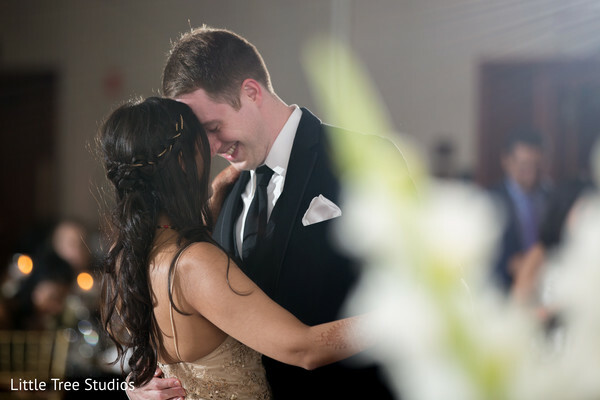 While I loved the ceremony, and it meant so much to me and us as a couple, my favorite part was our first dance. It was our grand entrance to our friends and family as a married couple. It was the buildup of a weeks worth of events- our courthouse ceremony, prepping all the welcome bags, the mehndi, the welcome reception & rehearsal, all the build up of getting ready, the first look, and the ceremony- but all that fell aside. It felt it like it was the two of us even though there was a ballroom full of people watching. I just felt so happy- it was the perfect moment, and makes me smile every time I think of it. Our colors were White, Black, and Gold. We love sleek and clean aesthetics, and wanted it to look elevated. Delay Ket did our decor, which came out amazing! Honestly a lot of the design and aesthetics came from ideas and opinions I curated throughout my event planning past, with some new trends that I've noticed. 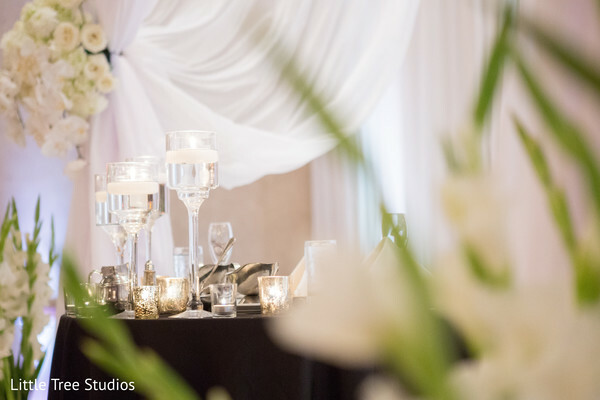 We alternated between high and low centerpieces to add dimension to the room. It was a necessity that the guests were able to see each other across the table. I've been to countless weddings where I wasn't able to talk to my friends because the lilies were in the way... also I figured if we are going to agonize over a seating chart, we wanted people to see who they were sitting with. We also had uplighting in a soft white all around the ballroom, which gave the room a nice atmosphere. On the tables, we had gold chargers, which contrasted against the black linen. and we did also have a Photo Booth courtesy of Josh Staley Productions. It was so much fun, and definitely a hit with my younger cousins! We did also have a small mehndi get together a couple nights before, which was nice to introduce my American friends and future in laws to the Indian culture. We had our mandap converted into our sweetheart table which was nice to have some space to ourselves and enjoy our dinner as newlyweds. We didn't have any special Indian dances during the reception- just a traditional American reception. Enjoy It! I loved my wedding day, and if I could re-do it I would do everything the same... maybe somehow have an extra hour for the reception because it was SO much fun. All my jewelry was old family heirlooms including the mangalsurtra. It was a gift given to my grandmother when she got married so she could give it to her son (my father and my mom) on their wedding day. It was supposed to go to her son, but as they do not have any sons, and it's a modern world, they gave it to me. The rest of the jewelry besides the wedding rings, were Indian style gold jewelry. My ring came from a local craftsman from Etsy, and Cody's ring came from a site called Manly Bands. We did not have bouquets or any traditional flowers, except for the big flower garlands for the ceremony. I don't think bouquet tosses are beneficial for any human being so it was an easy decision to ditch the tradition. Our Cake was so delicious! During dinner, neither of us were hungry. I think we were both so excited and pumped with adrenaline to eat anything. We have a few bites and then had our venue coordinator, Mandy, box up our meals and two slices of cake each (one vanilla and one chocolate), and send to our room to eat the next day. Our friends and family are all about the after party, so we made sure to scope out local Columbus restaurants. We found a mexican place around the corner from the venue which was just wonderful, because who doesn't love tacos at midnight after a bottle of champagne and hours of dancing? Come back tomorrow and discover more inspiring affairs! Short North Piece of Cake and Little Tree Studios are members of the Platinum Guide. Love what you see? Explore their portfolios.